I currently have an issue where my Arduino will connect and then disconnect repeatedly basically making it unusable. I'm using an Arduino Uno on Windows 10 (IDE 1.8.3) connected via a USB 2.0. I really have no idea what to do to fix this. I tried alternative devices in the port and they worked ok so I don't think the port is faulty. I also tried it on other ports and the same thing happened. I'm also pretty sure this worked on my Mac (which I'm yet to try). Which leads me to believe it's a Windows 10 issue. Any suggestions would be much appreciated. Bad connection (cable or ports)? I've tried a couple of cables with the same result and also tried it in 4 different ports. The ports work fine for other devices as well. This is the normal behaviour for some 'Arduino' type boards, but is you have not told us what board you have, I can't be sure. Brand (If a clone) & model, current sketch with wiring, what was the last thing you did BEFORE it stopped operating 'correctly' ? It's a Hobby Components UNO R3. It worked fine about 5 months ago, however I cannot remember how I set it up back then. I did notice tonight the circuit the Arduino stays connected. Apologises for the bad images. Basically I have my Arduino connected to a strip of 120 LEDS (Adafruits neopixels). Arduino 5V connection to LED 5V connection. Arduino gnd connection to LED gnd connection. Arduino data pin 7 connection to LED data connection with resistor in the middle. DONT run the LEDs from the Arduino, 150 LEDs can pull a lot more current than the Arduino can supply!!!!! What would be the best method of testing the programme in that case? So you recommend only using the Arduino for the data and have another power source? You were 100% right. I changed the circuit so the Arduino only supplies the data and another circuit powers the lights. Thanks for your help. 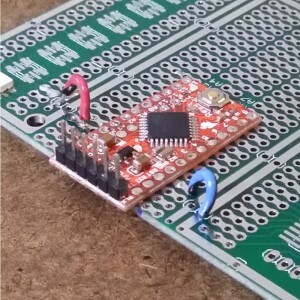 Just power the lights externally and use the arduino for sending data, otherwise the serial connection becomes unreliable. 150 LEDs requires far more current than the USB port can provide, so it turns on, sees that the load is too high and the computer disconnects the port. Now with the load removed, it tries to turn the port back on periodically, but every time the same thing happens because the excessive load was still present. It could also be the self-resetting PTC fuse on the Arduino board - depends on which one reacted to the overcurrent condition faster. Since you have them connected to 5v and Gnd, I'm guessing they're WS2812 or other addressable LEDs. You could maybe run 8-10 of those LEDs off USB power. Not 150. This thread is nearly two years old.